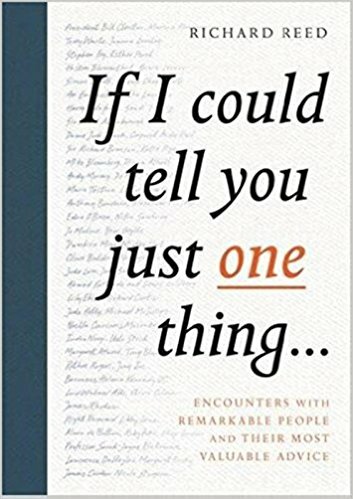 While I’ve never been an avid reader of leadership books in general, books such as Alastair Campbell’s Winning and Richard Reed’s If I Could Tell You Just One Thing are filled with useful tips. They highlight tangible lessons from a diverse range of interesting people, and I like to read a chapter every now and then to get inspired. President Bill Clinton, Clare Balding, Stephen Fry, Dame Judi Dench, James Corden, Margaret Atwood, Sir David Attenborough, Annie Lennox, Andy Murray, Joanna Lumley, Anthony Bourdain, Marina Abramovic, Sir Richard Branson, Sandi Toksvig, Jude Law, Nicola Sturgeon, Harry Belafonte, Olivia Colman, Simon Cowell, Martha Lane-Fox, Mario Testino, Esther Perel, Bear Grylls, Diana Athill, Mike Bloomberg, Ruby Wax, Alain de Botton, Jo Malone, Heston Blumenthal, Ruthie Rogers, Nitin Sawhney, Katie Piper, Richard Curtis, Shami Chakrabarti, and Michael McIntyre are just some of the many inspiring people who appear in Richard Reed's fascinating book.